The Premier League is back after a week and a half hiatus. Week 31 kicks off this weekend and the past week left us with a reminder of what things will be like in a little less than two months from now. I have never been a big fan of international soccer and having this little breaks for tournaments and friendlies makes it all the more annoying. There is nothing worse than having one of your club team players go down with an injury while away with their national team. 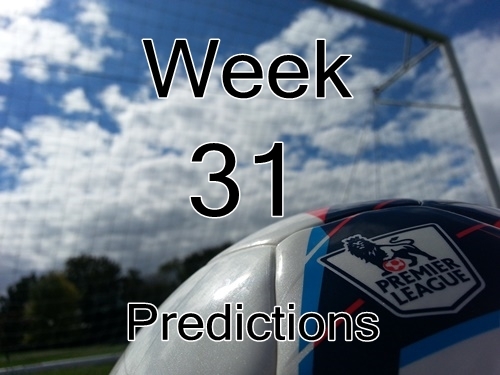 This weekend my EPL predictions include wins for three of the top five clubs. With Arsenal hosting Liverpool I’m predicting a draw, however, I would shade this slightly in favor of Arsenal considering their recent form coupled with being the home team. Aston Villa and QPR both have two match weekends including facing each other on Tuesday in a crucial relegation match. QPR have two difficult games this weekend that could see them all but relegated depending on results around them. For fantasy Premier League managers I have also put out the weekly player rankings and you can also read my defender rankings over at Togga.